Backup Platinum is an Windows platform backup program to make another copy of your important stuff so if your PC burns/gets pwned/crashes etc you won’t lose everything. It supports backup by Hard or USB drives, CD-R/W or DVDÂ±R/RW media, FTP server or Local Area Network (LAN). It’s easy enough to download and install, you can grab it here (It’s only 2.6MB). You’ll need Microsoft 95/98/ME/NT/2000/XP/2003 and about 3MB of free disk space. 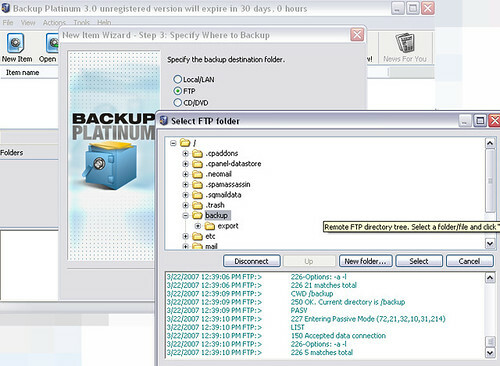 The interface immediately fires up a backup wizards when you first start the software, this guides you nicely through how to setup a new backup job or synchronize your data between two locations. 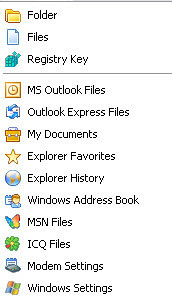 It supports a good range of files such as Registry Files, Outlook Express Files, MSN Files and so on. Sadly it’s too MS-centric, I would like to see support for Thunderbird and Firefox files and settings. I tested backup via FTP and it worked well allowing me to browse the remote FTP location within the interface and choose the location I wished to save the files. It supports various encryption options (128-bit) with Blowfish to ensure file integrity and confidentiality. The DVD/CD-Writing module also supports spanning across multiple disks and it integrates with windows scheduler so once you have created the jobs you can schedule your backups at regular intervals. Backup Platinum is priced at a fairly reasonable $67USD per license, honestly for this kind of software (it’s not rocket science) I’d prefer to see it around $30USD. It’s simple software and it does what it’s supposed to do, good job.